LeBron James has defined the last decade of the NBA, and it’s natural that people want to compare these Finals with some of his previous visits. Measuring this Cavs motley crew against the supporting cast James dragged to the 2007 Finals has been a popular parlor game since Kevin Love’s injury. Cleveland optimists have dredged up the 2012 Finals, when James and an army of shooters beat back a hot-shot Western Conference powerhouse from Oklahoma City that wobbled at the sight of the throne. And there is the hovering ghost of last year’s Finals, when an aging, thin LeBron team surrendered against a dynastic blur from San Antonio that ran it to exhaustion. That is the precedent most worrisome to those of us hoping for drama. Golden State has been the better team all season by any standard, and it smashed through much tougher obstacles to get here. It is a deserving favorite. That doesn’t mean it will win. Let’s dig into seven questions that will shape the 2015 NBA Finals — and determine which long-suffering fan base will bathe in championship elation. 1. Can Cleveland’s Defensive Resurgence Be Sustained? The Cavs have been spectacular in rampaging over the East since James returned from his midseason vacation, especially during a 12-2 playoff run in which they discovered a gritty and brutal new identity. They have outscored postseason opponents by 10 points per 100 possessions, a better margin than Golden State, and as Kevin Pelton pointed out at ESPN.com, that (slight) superiority holds up even when you adjust for the quality of competition. This is the most interesting subplot of the Finals: We are about to find out how much of Cleveland’s ascendance is about the weak-sister East, and how much is about the Cavs. The proving ground will come on defense, where the suddenly impenetrable Cavs face an Evel Knievel–level leap in competition after dispatching a series of overmatched and broken offenses. Even in eviscerating the East, Cleveland invited trouble on a dozen or so possessions every game with little hiccups — a lazy closeout from LeBron, Kyrie Irving smashing into a pick, J.R. Smith checking out away from the ball, flat-footed team defense in transition. You can survive that against the East, but not against the flame-throwing Warriors. The margin for error is gone. The Cavs may have to monkey with matchups almost from the beginning. Irving, even at full health, just doesn’t have the chops to navigate the maze of screens Stephen Curry will scamper around (and set!) both on and off the ball. Do you trust the combination of Irving and Smith to suss out even the routine Curry–Klay Thompson screening actions that dot every Warriors possession? Irving will probably start on Curry, but if that brings carnage, the Cavaliers may have to slide Iman Shumpert onto Curry fast. That would leave two unfavorable matchups: Irving on the scorching Harrison Barnes, and LeBron or Smith, with his short attention span and addiction to ball-watching, on the always-moving Thompson. There will be no good hiding spots until the Warriors bring in Andre Iguodala, Shaun Livingston,1 or Leandro Barbosa, but inviting Barnes to post up Irving — and helping as needed — might be a less bad choice than offering up Irving as a sacrifice. If the Cavs have Shumpert and Tristan Thompson2 on the Curry–Draymond Green combination, they might be able to switch that pick-and-roll without experiencing too much pain on either end. The Cavs can even jack up the drama by moving LeBron onto Curry in crunch time. Every Golden State playoff opponent has tried switching bigs onto Curry to prevent seams from opening, but Thompson is the first enemy big since Anthony Davis with the quickness to (maybe) hold his own. Thompson, always crouched in a perfect stance, might be even better than Davis at this discrete skill. Getting switchy with it brings risk: It takes a rim protector far from the hoop and leaves a smaller guy to deal with Green on the block — one reason the Warriors have amped up their offensive rebounding in the playoffs. But the Cavs switch well, and they may need to do it liberally to have a shot. Against Cleveland’s starters in the regular season, the Dubs would simply pivot into Curry–Andrew Bogut pick-and-rolls — tugging in Timofey Mozgov, who won’t be able to contain Curry off the bounce. And that brings up the most interesting dilemma David Blatt will face: How much does he want to play small, with James Jones or LeBron at power forward? We know that the Cavs will play the first seven minutes or so of each half with the Thompson-Mozgov duo, which has smushed everyone on the offensive glass. How Blatt splits the remaining 32-plus minutes will have a huge impact on how this series plays out — on both sides of the ball. Going small, with Thompson at center, brings the lure of switching almost everything, and Cleveland has suffered only a minor drop-off on the offensive glass3 when Thompson mans the middle alone. Going smaller frees the Warriors to play those gleeful, unguardable lineups with Green at center, but at least those groups feature one of those safe places to stash Irving on defense. The Cavs will have to play small ball just to tread water on offense. You can’t score enough against Golden State’s league-best defense running pick-and-rolls with two non-shooting big men clogging the paint — not even with LeBron running the show. Ask James Harden. Golden State will drop its big men back, squeeze the paint, and stay at home on the outside shooters surrounding LeBron. It can also switch any pick-and-roll that doesn’t involve Curry or Bogut — especially when Green is on Thompson, LeBron’s favorite dance partner. Cleveland already knows all of this, which is why it has ditched the pick-and-roll so often and turned LeBron into a battering ram in the post. But even that caveman basketball is easier to defend if two big men are lurking on the other side of the paint. If Thompson can stick with Curry on switches, those small-ball groups might be a win-win for Cleveland, even if it punts two or three offensive rebounds every game. Playing big ball requires a different style of defense, but the Cavs should have that in their toolbox, especially if they watched film of the Rockets’ best defensive possessions in the conference finals. And that’s the basis for hope here — that both Cleveland lineup types could at least suppress a total volcanic eruption from Golden State’s offense. That is a defense already strained to its breaking point. Two guys are attached to Curry 30 feet from the rim, leaving three defenders to deal with four Warriors behind the play. If Curry can slide a pass to a rolling Bogut or Green, they can pick you apart. Look carefully at that play and imagine Bogut under the rim in place of Marreese Speights. 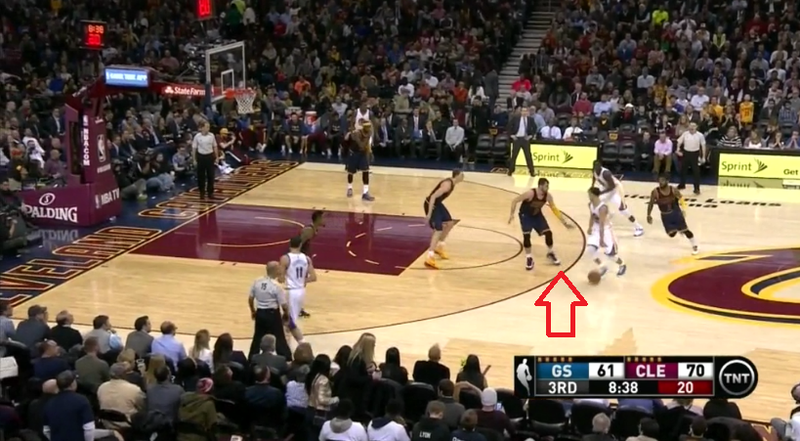 Smith is glued to Thompson in the corner nearest Curry, and that, plus the trap on Curry, reduces the Dubs to working a 3-on-2 with Green, Speights, and Iguodala on one side of the floor. Jones crashes hard off Iguodala, and Kevin Love zones up between Green and Speights before finally pulling a very Love-y half-lunge toward Green. Green has choices, but none of them is a cinch. He can hit Iguodala, an unreliable shooter, for a catch-and-shoot 3; try a floater; drive at Love; or thread a lob pass to Speights. Golden State will win a lot of these mini-battles — Green has gotten really good at hitting Bogut with alley-oops — but if you’re not switching on Curry up top, you have to force the bit players to beat you with tough plays. Golden State is in a better formation here. Thompson is in the weak-side corner, meaning the normal help defender (Shumpert) has an impossible choice: fulfill his help duties and leave Thompson open for a short 3, or bail early and risk Green giving Mozgov some Blake Griffin flashbacks. Shumpert probably makes the right choice, and Green still finishes a tip-your-cap play. 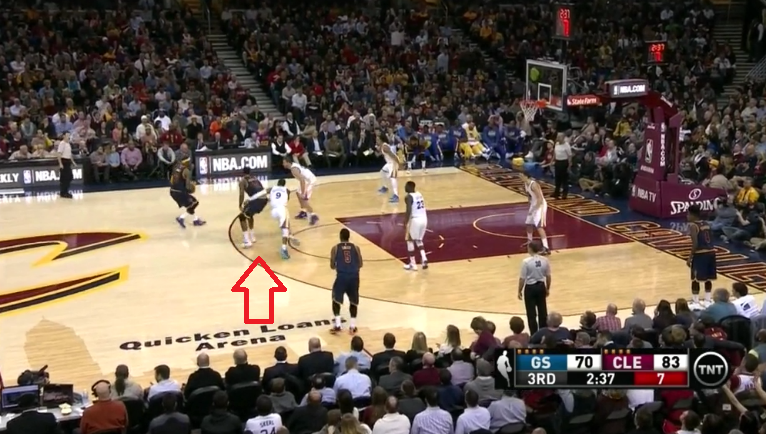 Check out Love abandoning Iguodala in the opposite corner. That’s the kind of instant, counterintuitive read the Curry pick-and-roll forces on defenses: Instead of helping in the normal fashion, maybe it’s better to ditch the rules, leave Iguodala alone in the corner, and force the Warriors to kick the ball around. That kind of on-the-fly retooling is hard, even in the Finals, with more downtime and just one opponent to scout. Habits become ingrained. But the Cavaliers flashed the right idea for a non-switching scheme, and they have the talent to switch effectively when they go small. Do both well and they’ve got a fighting chance. 2. Cleveland’s Offensive Rebounding Machine vs. Golden State’s Fast Break: Who Wins? This X’s-and-O’s subplot could be the inflection point for the series. Even while playing at a slower pace, the Dubs have raced to nearly 22 fast-break points per game in the playoffs — a hair above their league-leading regular-season mark. This is the deadliest fast-breaking team in the league. The Cavs, meanwhile, are punking fools on the offensive glass. They are like a horror movie villain beating down a barricaded door; you can hold them off for only so long. Thompson has humiliated everyone in his path, sometimes literally tossing victims aside to claim his territory. But sending two or three guys flying toward the offensive glass is a massive risk against Golden State. Fail to secure the rebound, and the Dubs are flying in a V-formation — Green rumbling up the floor with shooters around him — while your guys are regaining their balance under the rim. At that point, you can only pray to the basketball gods for relief. The flip side is that if Golden State is (rightly) scared of those Cleveland putbacks, it may keep an extra player or two around the glass, punting whatever head start it might be able to get in transition. This is a tough one to read. The Warriors are a mediocre rebounding team, but when both Green and Bogut are on the floor, they clean the defensive glass as well as anyone — another reason why Golden State may play more big ball than expected in this series. If Bogut and Green can handle the glass almost on their own, at least two of Golden State’s other players can prime themselves for a fast-break race. Cleveland can be lazy in transition defense, though it’s cleaned that up in the playoffs; it’s allowed just .95 points per possession on transition chances, stingiest among all teams that advanced past the first round, per Synergy Sports. It was much worse in the regular season, and it cannot afford any halfhearted effort or dumb gambles against Golden State. The Cavs aren’t quite as fearsome on the glass with just one of the Mozgov-Thompson combo, and they may need to play heavy small-ball minutes in order to goose the offense. But Thompson is plenty scary, and he will own stretches of this series. 3. How Much Help Do You Send at LeBron James? You know LeBron is going to post up a ton, especially when the double-big lineup doesn’t leave space for anything else, and a number of coaches4 have suggested that Golden State leave LeBron one-on-one and let him score as much as he wants. Golden State has other anti-LeBron options, but James can overwhelm all of them with sheer power. If either Green or Barnes can keep LeBron from the rim, leaving that defender on an island might be a good way to exhaust LeBron and vaporize all the open 3s he sniffs out when he draws help. It would also force the Cavs to battle 4-on-4 on the glass behind LeBron instead of having help defenders rush to find boxout assignments. Steve Kerr will be judicious, but this is an idea that sounds better in theory. If LeBron knows that no help is coming, he can get to the rim whenever he wants — by backing dudes down or facing up for turbo drives. He will get layups and draw fouls, and Green already has to be wary about picking up extra fouls in rebounding scrums with Thompson. The Dubs are minus-36 in 163 minutes with Green on the bench in the playoffs. He has become nearly as important as Curry in defining Golden State’s identity; lineups without Green sacrifice spacing or size, and they just don’t function as well. Green experiencing foul trouble will be an X factor in at least one of these games, and if it happens more than that, the Cavs will be in business. The Warriors are also an exquisite help-and-recover team — the best in the league. One guy sinks in to help and everyone else shifts around the floor in concert so all the best passing lanes are blocked off. The helper drifts back out and everyone shifts back in kind — a gang of 6-foot-6 marauders working under a mind-meld. Is it perhaps the only team that can double-team one player and somehow still appear to be everywhere at once. Every pass LeBron whizzed across the floor against Atlanta and Chicago will be harder in this series. Bottom line: The Warriors won’t overcommit, but they’ll send some well-timed swipes at LeBron from an ever-changing array of places. 4. Will LeBron Rediscover His Jump Shot? If Golden State can wall off the paint and chip away at Cleveland’s LeBron-generated 3s, the Cavs will have to find other ways of scoring. LeBron will get a ton of decent jumpers, and for the Cavs to win, he has to snap one of the worst jump-shooting slumps of his career. LeBron is shooting a wretched 33 percent on long 2s and an unthinkable 17.6 percent from deep in the playoffs. The Spurs unnerved LeBron by playing an extreme version of this defense in the 2013 Finals, but by the end of Game 4, LeBron had rediscovered his happy place. If it takes him that long in this series, the Cavs are toast. 5. How Much Can Irving Give? Blatt indicated Monday that Irving’s recovery from knee tendinitis has been slow, and if Irving is limited, the burden will fall on LeBron alone to shred the league’s best defense. And that is probably too much, even for him. Even if the Cavs hide Irving on Barnes, Iguodala, and other back-end options, he will have to work on defense. The Warriors make everyone work; it’s kind of their thing under Kerr. They’ll play around with a funky Curry-Iguodala pick-and-roll if it puts Irving in the play — and perhaps forces Irving into switching back onto Curry. Klay Thompson will guard Irving a lot,5 an adjustment that makes it easier for Golden State to switch any Irving pick-and-rolls — including the dreaded Irving-James combo. Leaving Thompson to fight for rebounds against Cleveland bigs after that switch isn’t ideal, but it’s a trade-off that Golden State will accept to maintain its defensive integrity. The Cavs need Irving to attack Thompson and roast those switches. Their best small-ball lineup — Irving, Smith, Shumpert, James, and Tristan Thompson — has logged just 24 minutes all playoffs, and while the version with Matthew Dellavedova in Irving’s place has been lights-out, the Cavs will need more of their A team to beat the Dubs four times. 6. Which Team Finally Stalls Out When Its Stars Sit? The Cavs have outscored opponents by 12.5 points per 100 possessions with LeBron on the bench in the playoffs. The Warriors are a fat plus-5.4 by that metric without Curry. Those numbers are shocking, considering how badly these teams wilted in the regular season without their MVP candidates. Festus Ezeli’s hands have played above expectations, but the rest of the bench has been solid almost all season. Maybe the Cleveland bench can extend this high-wire act another two weeks. But if I’m betting on one bench to wring out enough points and stops, I’m taking the Warriors. 7. Can Cleveland Win the Turnover Battle by a Big Margin? The Cavs need to pick at the closest thing Golden State has to an Achilles’ heel, but in the playoffs, Cleveland has forced turnovers on only 11.8 percent of enemy possessions — a number that would have ranked last in the regular season, per NBA.com. It might be able to jack that number up by taking the ball out of Curry’s hands and forcing Golden State’s secondary players to ping the ball around. Golden State has coughed up more turnovers than any playoff team, and Cleveland will need some fast-break buckets. The Cavs are thin and banged-up, but they have some real answers for Golden State’s parade of 3s. Their furious offensive rebounding is a problem, especially since teams deal with fewer and fewer opponents who munch glass like that. But over 97 games, the Warriors have had answers for everything — every type of team, every lineup, every matchup. As long as Green avoids foul trouble, the Warriors don’t particularly care whether you go big or small; they can be both at once. They are 46-3 at home, they haven’t lost four-in-seven at any point in this season, and you can count on them winning one or two games in which Curry and Thompson lose their minds. It will be easier for Golden State to hide Curry than for the Cavaliers to find Irving a safe haven. This should be the series in which Cleveland finally feels the absence of Love — the one big who could provide both spacing and rebounding. A post-up threat on smaller guys like Irving. They could even get funky and stick LeBron on Draymond Green, and have Thompson guard a wing player. They have rebounded 32 percent of opponent misses with the Thompson-Mozgov duo in the playoffs, and 28.5 percent overall. Some current, some out of the league for now. With Curry likely hiding on Shumpert, Smith, and Matthew Dellavedova. I nearly blacked out when it happened.